Luxurious and packed full of tech. No other car offers as relaxing an escape from the utter chaos of UK roads as effectively as the Audi A8. Sit back and enjoy - whether you are driving, or being driven. Space is often considered to be the ultimate luxury when it comes to vehicles and it’s safe to say that, having sat in the rear and been shown the sights and sounds of Kettering* as well as sat in the driver seat to return the favour on this test drive, the A8 is the pinnacle of luxury saloons. The first production car in the world to be developed specifically for automated driving. We tested the Audi A8 L, which has a stretched wheelbase. But even in the standard version, you can relax in exceptional surroundings with quality radiated all around you – from the optional rear-seat entertainment pack with two Audi tablet screens so you can watch Homes Under the Hammer to the front-and-rear seat ventilation with massage function – all punctuated by the most advanced technology currently found in any car. 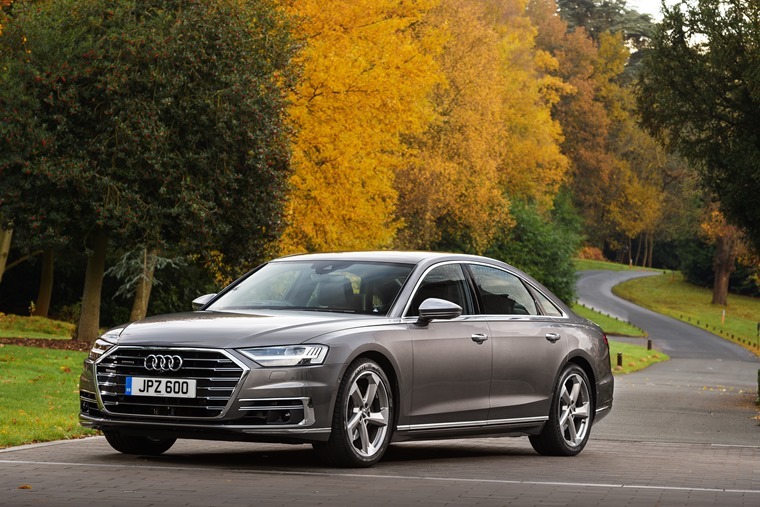 No surprise really when the Audi A8 is the first production car in the world to be developed specifically for automated driving, with piloted functions such as the Audi AI parking pilot, garage pilot and traffic jam pilot all being gradually rolled out over the year. Alas, in the UK it will be some years before we ever get to fully experience the types of autonomous driving it promises. Technology then is at the heart of Audi’s new design language which replaces the rotary-control based infotainment system of yesterday with an innovative new touchscreen concept. Add to that the exclusive use of an electrified MHEV drivetrain and the A8L is ideally placed to spearhead the importance of technology to the Audi brand going forward. With a wheelbase 13cm longer than the regular A8, coming in at a gigantic 5,302mm, the A8L looks as imposing as it sounds. This user-interface appears as soon as the door is opened, with the infotainment controlled via the large 10.1in touchscreen and a second touchscreen below controlling everything from air conditioning and heated seats to providing a keyboard to type instructions onto. One thing that has become a concern to me as we move away from physical dials to touch-screen based interfaces is the dangerous unresponsiveness or acknowledgement to what you’re doing, so a reassuring little touch from Audi is a click being heard and felt with each choice made on the touchscreen that helps put your mind at ease. 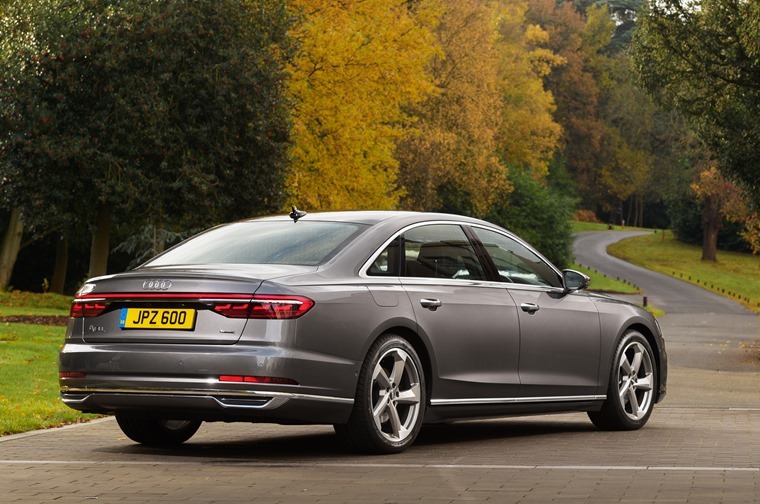 The A8 makes its debut with two re-engineered V6 engines – a 3.0 TDI and TFSI. For this test drive we were in the TDI which offers 286 PS and works in conjunction with a belt alternator starter which is the nerve-centre of a 48-volt electrical system – the aforementioned MHEV which allows the car to coast with the engine switched off and restart smoothly in order to bring down fuel consumption by 0.7 litres per 62 miles in real world driving conditions. As serene an environment as I’ve found on four wheels. With a wheelbase 13cm longer than the regular A8, coming in at a gigantic 5302mm, the A8L looks as imposing as it sounds. Viewed side-on the front-end and gently inclined rear give an elegant shape to the vehicle, further emphasised by the optional Matrix LED headlights and dynamic rear indicators which produce unique light animations when approaching and leaving the car. While relatively sluggish to move from stationary, there’s a quiet and smoothness to the ride that emphasises how comfort-focused the car is for everyone in it. Road noise is next to nil, while the cars gargantuan proportions seemed non-existant thanks to the dynamic all-wheel-steering system which combines quick and direct response with unshakeable stability, on top of the quattro all-wheel drive and the surface-supressing comfort of adaptive air suspension. But, in spite of all that, it’s a car to be driven around in. While technology doesn’t necessarily equal luxury its is of increasing importance to everyone, and with over £35k worth of accessories ranging from the aforementioned DAB TV and massage function all the way to panoramic roof, blinds, and Bang and Olufsen Soundsystem, there are settings for everything and it’s the kind of place you can relax or work to your hearts content. Ultimately, the Audi A8 is as serene an environment as I’ve found on four wheels, with no other car offering as relaxing an escape from the utter chaos of UK roads as effectively as this car. For the ultimate relaxation, just get someone else to do the driving and sit back and enjoy yourself.